In the meantime, you may click on the 'sales' section to view my jewelry design style. Orders and/or convo's will be promptly taken care of upon my return. Thank you for you kind patience. I'll see you soon. This necklace is so unique....and the shop owner is wonderful to work with. I highly recommend ordering from this store.....you won't be disappointed. 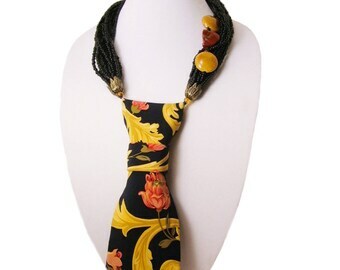 I cannot tell you how many compliments I receive on my tie necklaces...they drive the boys crazy!! ;) Luz you are a true artist and amaze me! Classic Prep School wear turns Ivy League accessory. A new accessory for you...Your Royal Highness. Graceful lines. Vivid colors. I introduce Filigree - just for you- Fashionista. & place it in the hands of the modern day Fashionista. I'm Luz, your Stylist. It is a pleasure to meet you. Estilo Margot simply began with an idea. One day I stumbled upon the beading section in a craft store & thought "I can do this." So I did, and the 'Just Once' series was born. Another time I couldn't decide if I should wear a necklace or a necktie with an outfit, then I said "Why not both?" and 'Tie Candee' came to life. With every piece I create, I want to assure the final design exudes a certain boldness & confidence. The very same observed in a picture of my grandmother, Margot, who inspired my shop's name. If I EM not working with a repurposed necktie, I first -manually or digitally- sketch the grand majority of the designs before I even sew, bead or wire wrap anything. Afterward, I go on a fabric and/or bead hunt. In the studio, I'll either be watching an old B&W, a home decor program eagerly awaiting a room reveal, admiring artistic plates on a cooking show or have my radio playing the likes of Andrea Bocelli, Rascal Flatts, Strunz & Farah, Toby Mac, El Gran Combo John Legend or Tony Bennett, just to name a few. As you can see, many things inspire & provide endless themes for my necklaces. Just as our personalities are distinct, I want every necklace -your necklace- to be distinct. So much so, that it will be quite the conversation piece wherever you go. Precisely what Estilo Margot is about. Items Inspired by Culture, Nature & You. In reality, I don't think I EM different from anyone else when it comes to being inspired. Of all the very many objects, colors, shapes & textures that exist, one is bound to create by simply observing & appreciating surroundings. You'll find additional shop information below, however, If you have a question or comment regarding shop policies, my designs or any other inquiry, I'd be glad to assist. Please contact me via convo on Etsy and I will respond as quickly as possible. I want you to be 100% satisfied with your Tie Candee, however, if not completely satisfied and wish to return, please convo me via Etsy within 3 days of delivery. I will be more than happy to resolve any matter. Item must be returned in its original, saleable condition within 7 days of delivery. Refunds are less shipping and handling fees. Customer is responsible for return shipping; returning in trackable form is recommended as Estilo Margot is not responsible for missing nor lost packages. I take the utmost care in designing & creating your necktie as well as packaging and shipping so that she may arrive in a presentable and safe manner. Please understand, if a Tie is not returned in its original, saleable condition, it cannot be refunded. Your personal billing information is neither stored by my shop nor revealed to me at any moment. Sales tax solely applies to Florida residents. Prices are subject to change at Estilo Margot's discretion. Items will ship within 1-3 business days except Sundays and Federal Holidays. I send confirmation emails verifying I have shipped the order and continue to monitor shipping until it has reached your destination. The domestic shipping option is via USPS First Class & is due to you in 2 to 5 business days. It serves the continental United States, Alaska, Hawaii and Puerto Rico. International orders ship via USPS First Class International with varied delivery time frame depending upon customs processing in your region and your local postal service. Please review accuracy of address provided on your order to prevent any delays. All import taxes, duties & custom fees are the sole responsibility of the buyer. Please note slight, natural imperfections on beads are expected due to variations in color, shape, size and/or texture and even how they have weathered elements of nature.. Returns are not allowed for these reasons. 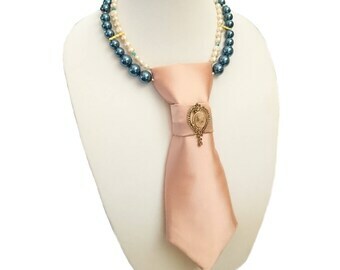 ~After receiving your order, a very gentle tug here & there can restore shape to your Tie Candee necklace. ~Whether I buy a finished tie or sew my own design, I do share the the type of fabric used. If ever the need to iron, I highly suggest using the lowest setting possible while overlaying Tie Candee with another fabric such as a thin cotton. ~Spot clean any spills or stains (according to the type of fabric) if/when they occur. Do not machine wash Tie Candee. ~Every so often, gently wipe beads with a soft, lint free cloth to rid of any oils and/or dirt that may accumulate with time. ~If ever necessary, you may use a very small amount of tarnish remover on a cotton swab in order to clean & restore shine to the *sterling silver or *silver-plated beads/findings while being mindful of fabric & other beads in close proximity. I describe necklace measurements by "drop size" which is the distance the necklace begins from the clasp (on the nape of your neck) to where it ends at the necktie. That full length is where the necklace 'drops'. You can use a flexible measuring tape just to get an idea of how low an Estilo Margot necktie will fall. Make sure you are standing in front of a mirror as this will give you a true perspective. Hold one end of the tape at the center on the nape of your neck and let the other end fall in front of you (on your chest). Now you can see the inch marks & have a better idea how a 7", 8" or 9" drop would look on you.